Why settle for old flooring when we can give you an option that is much more appealing? Even though vinyl floors of years past were durable, they were not as stylish as they are today. At our flooring showroom, we carry high-quality luxury vinyl flooring that is unmatched in resilience and beauty. Add a level of sophistication and appeal to your home or business with our selection of luxury vinyl tile (LVT). Due to the latest advancements in technology, these floors come in all varieties and can be fabricated to look like other flooring materials. We stock our showroom with these attractive flooring options that impress. Stop by our showroom for a complete line of products that are sure to suit your needs. Built to last, LVT floors are highly resident and manufactured to appear like ceramic, hardwood, stone, and other types of floors. Using 3D printing technology, manufacturers create luxury vinyl tile that capture the color, style, and pattern of any material. Due to the fabrication methods, LVT floors offer the beauty and durability that many customers are looking for. They create amazing depth and realism that fool even the most observant guests. Allow the flooring experts to help you choose the perfect flooring for your next project. Strong and versatile, vinyl tile can easily enhance any room in your home or business. The latest advances in the flooring industry mean that materials and products are more durable than ever before. We are proud to offer top-quality resilient flooring that provides many years of wear. Just as the name suggests, this option proves resilient in even the most active households and businesses. Unlike traditional vinyl tile from decades ago, this vinyl flooring offers an impressive appearance along with impressive performance. If you are in search of new floors to enhance your space while holding up under the stresses of heavy foot traffic, multiple children, and even pets, this is the perfect option for you. Give your home added character with luxury plank flooring. Due to the materials used during production, these floors never warp due to moisture or temperature changes. Choose the look you want – beautiful hardwood or a natural stone finish. Whatever you select, you need flooring that adds rich character to your home or business. Bring the appearance of hardwood or ceramic tile into your space, and enjoy the durability, easy maintenance, and stunning appeal of luxury vinyl tile flooring. In addition, these flooring types are easy to maintain. Simply sweep when dirty and mop occasionally. 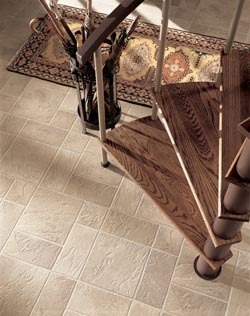 We offer a wide variety of styles from brands like Floorcraft® and Star Values®. Do You Need Luxury Vinyl Flooring Installation? Any new floor needs a sturdy and level surface. In order to ensure long-lasting and quality LVT flooring, it’s important to accurately prep the surface. That’s why we take care to do everything right. We use flooring contractors that are skilled at making sure the floor is smooth, clean, and level before luxury vinyl flooring installation. You’ll be impressed with the finished product for many years to come. Contact us for more information about our LVT floors we have in stock. We proudly serve customers in Carroll, Denison, Jefferson, Harlan, and Lake View, Iowa, as well as the surrounding areas.